Rob Grant and Mike Kovac are two lifelong friends who make horror movies. When they get a creepy video sent to them by "fans" who go shopping for body removal items, mirroring a sequence in one of their films, they are deeply disturbed. Deciding to examine their responsibility for real world violence, they begin to look at the differences between real world and movie violence in every possible way. However their quest to know the effects of real world violence takes a turn for the worst and put their lives in danger. 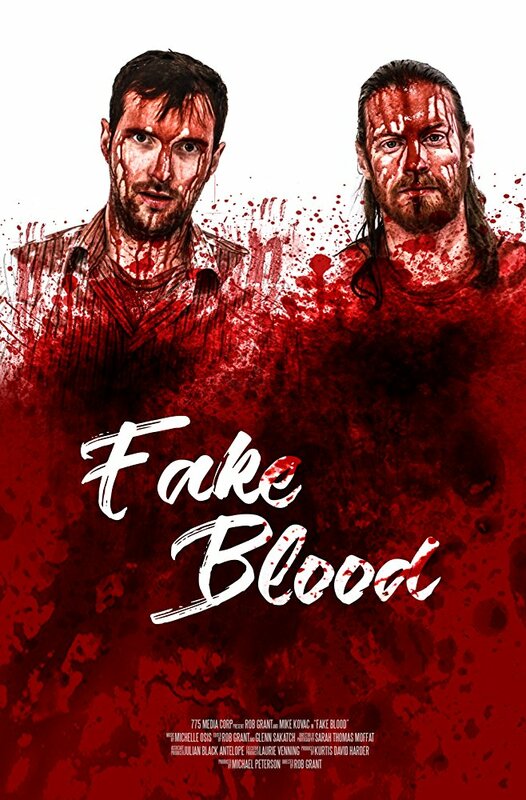 FAKE BLOOD is a film with a wicked kick to it. Beginning as a kind of home movie/podcast where Grant and Kovac talk with each other and friends about screen violence and the responsibility of filmmakers, the film is good but nothing particularly rave worthy. Things however begin to change as the pair decide that they are going to really investigate the difference between reality and fantasy by firing guns, trying martial arts and talking to people who do bad things. It's at this point the film begins to get its claws into you and the longer it goes and the farther things go down the rabbit hole the more gripping the film becomes. It gets so deep into your head that well over a week later I still can't shake the film. I'm not going to go into a deep discussion of the film, not because the film is bad (its in the running for my Best of the Best of 2017 list) but because as much as I want to, and trust me I want to, I'm not going to spoil what happens. This is one of those films with a twist or two and I don't want to prevent you from having your jaw drop open with each new revelation- trust me this does not go where you expect and it isn't done until the credits role. What I will say is that the film's discussion about the differences between various types of violence and filmmakers responsibility are enlightening. While they may not shake the pillars of heaven they do provide a great starting point for post viewing discussions. This is a film you'll want to have dinner plans after so you can talk about it with whomever you see the film with. As for the second half what can I say, the turns were unexpected. I still don't know what to think about them other than I really need to see the film a second time. If the film wasn't a documentary I would be hard pressed to believe what happens. All I'll say is that the film loses the focus on movie violence and begins to look at real world crime. As I said above I am haunted by the film a week later to the extent in the days after seeing the film I started watching films for DOC NYC, a huge documentary festival in New York and I've found I'm still comparing those documentaries to FAKE BLOOD. One of the great film finds of the year, FAKE BLOOD is one of the best films at the Portland Film Festival, of 2017 and a must see when it plays tomorrow afternoon.